I often drive Route 126, the winding road that connects the Central Valley to the highlands of Poas and the lowlands of Sarapiqui. From my place, it’s the quickest route over the mountains and as luck would have it, also acts as an easy portal to a host of birding opportunities. Having birded and guided along this road on many occasions, I’ve written about this birdy route before, this time I’m going to talk about one of the lesser known sites situated in the foothills. 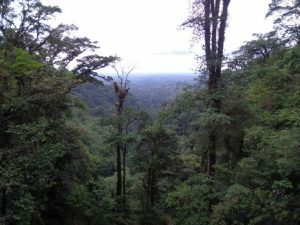 Past Cinchona and Socorro, the warmer, more humid air and calls of Black-headed Saltators and other birds indicate a change in elevation. Eventually, the car passes an obvious sign for a coffee tour on the right. This is “Mi Cafecito” and whether a birder feels like just having a coffee and bite to eat or also searching for foothill species, it’s always worth a stop. 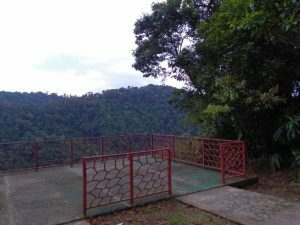 While most folks visit for the coffee tour, free trails are also available that lead to overlooks and access a bit of foothill forest. Although they aren’t all that long and don’t get down into the forested canyon, I suspect that they have good potential for birding. Well, actually, after my first guiding visits, I know they do! Although both occasions were just a couple of hours, I still had good birding both times with several nice species. Opens at 7: Six would be better but seven is still good especially for a place that was designed more for coffee tours than birding. 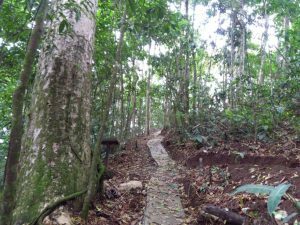 Free access: The folks at Cafecito welcome visitors to use the trails. Please support them by buying something at their souvenir shop and dining in their restaurant. Good, country Costa Rican fare is served. Cement trails but slippery: Unfortunately, some parts of the trails can be slippery. But the birding is still worth it especially because one can walk on the side of the trail. Overlooks: Two of the trails lead to excellent overlooks that provide views of the canyon. White Hawk is regular and several other species are also possible including hawk-eagles, King Vulture, and Barred Hawk. Great Green Macaws are also present at times. Who knows, maybe Lovely Cotinga might also show at some point? Although very rare, the species does occur around there. Waterfall: Not so much for seeing the cascade but for seeing Lanceolated Monklet. Although I haven’t heard or seen one there yet, the elusive mini puffbird does live close by and likely occurs in the canyon. I would not be surprised in the least if it shows at Mi Cafecito. One of the views from the Waterfall Trail. Tanagers: Both times, I had pretty good flocks of tanagers, on the trails and at the overlook. We had good looks at Emerald, Speckled, Black-and-Yellow, Golden-hooded, Hepatic (Tooth-billed), Silver-throated, and Carmiol’s Tanagers along with the uncommon White-vented Euphonia, Slaty-capped Flycatcher, Smoky-brown Woodpecker, Black-faced Grosbeak, and some other birds moving together. 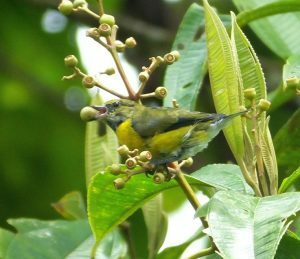 This funky looking little bird is a juvenile male White-vented Euphonia. 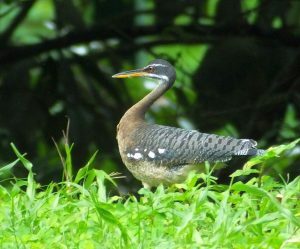 Sunbittern! : Seeing one of these odd, special birds forage at the edge of a pond was a nice surprise! Although the streams at Virgen del Socorro look good for it, the bird doesn’t seem to be present. Or, if it is, it must occur in very small numbers or maybe just doesn’t use the areas visible from the bridge and road (?). But, no matter because you can see it at Cafecito! At least we did, one was showing very well and since the ponds are permanent, it looks like the site might also be a reliable bet for Sunbittern. Porterweed hedgerows: Plenty of this popular hummingbird bush is present. We didn’t see too much but it could attract Black-crested Coquette and maybe even Snowcap. Want to look for the monklet and Sunbittern? 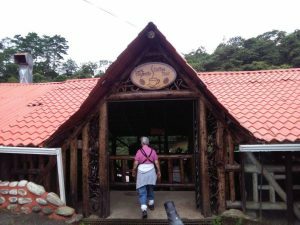 Let me know, I plan on setting up a tour that visits the site that can be done from the San Jose area as well as the Sarapiqui lowlands. I hope to bird there with you.